Recently the Inyo National Forest, on the east side of California’s Sierra Nevada Mountains, published a final environmental impact statement (FEIS) and draft record of decision (draft ROD, or draft plan) for its revised forest plan. If you remember way back to 2016, we were talking about crafting a vision for the future of this forest as well as two others in the Sierra Nevada. At that time the Inyo, along with the Sierra and Sequoia National Forests, had published a draft EIS and was looking for feedback to guide the development of the forest plan. These environmental impact statements are one of the key moments where people who love the outdoors can take action to protect the places they care about. Scores of outdoor recreationists commented and your input made a difference. Although we’re still waiting to see what the Sierra and Sequoia draft plans look like – the Forest Service is still working on those – we’re stoked on the Inyo plan. The Forest Service incorporated many of the management approaches Outdoor Alliance and its member groups advocated for. The draft plan recognizes the value of outdoor recreation on the Inyo, identifies high-value recreation areas, and includes lots of guidance for how to sustainably manage recreation so that the forest will continue to provide high-quality outdoor recreation experiences well into the future. In addition, the draft plan contains good instructions for how the Inyo should work with partner organizations to build and maintain trails and otherwise manage recreation. 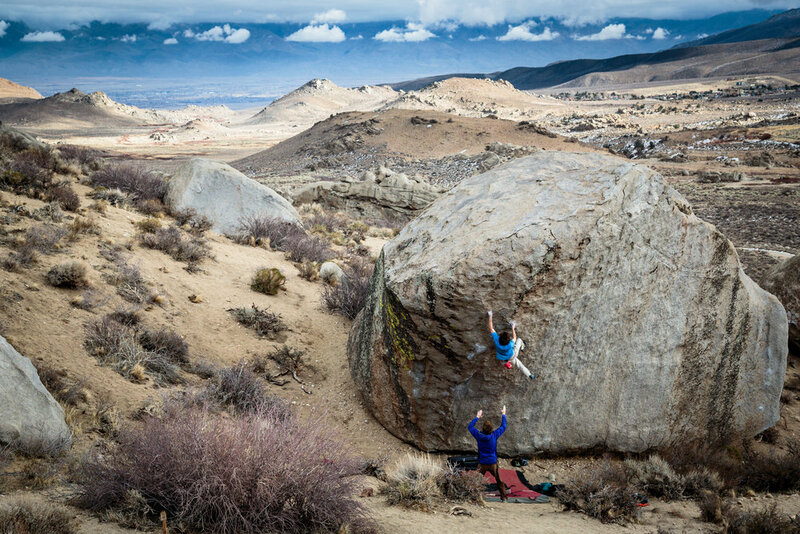 We believe strong partnerships between local recreation organizations and the Forest Service are essential and we’re pleased to see the Inyo plan provide a framework to foster these relationships. At this point in forest planning on the Inyo, we’re in what’s called the “objection process” – it is the final opportunity to comment on the plan, but you can only submit an objection if you’ve previously commented on the plan, your objection has to relate specifically to issues you raised in your previous comments, and you have to propose a remedy that would solve your objection. There are a few details in the draft plan that we think still could stand to be improved and a couple of our partner organizations will be taking the lead in pursuing these concerns. The Access Fund is submitting an objection related to language on fixed anchor use in Wilderness that would set a poor precedence and potentially create future climbing management issues in Wilderness areas in the Inyo. Also, while we’re happy to see that the Inyo has developed a winter-specific recreation opportunity spectrum, Winter Wildlands Alliance has identified some mapping errors within the winter ROS and other concerns with what is proposed in the draft plan. So, to address these concerns, the Access Fund and Winter Wildlands Alliance will be filing objections. After the objection period ends on October 3, the Regional Forester will review and respond to all of the objections. They may or may not decide to change anything in the draft plan in response to the objections but usually there are at least some changes made between the draft and final plan because of the objection process. After all of this is finalized the new Inyo Forest Plan will be complete. We’re expecting the final Record of Decision (aka final plan) in late 2018-early 2019.